A shoulder separation refers to the stretching or tearing of ligaments where the collarbone (clavicle) meets the shoulder blade (scapula). If these ligaments partially or completely tear, the clavicle can slip forward and detach from the scapula. This injury is usually caused by an impact to the front of the shoulder or by falling on an outstretched hand. Shoulder pain, and tenderness are common. Sometimes there is a small bump on top of the shoulder. The severity of the separation is determined with x-rays . Conservative treatment is the first option. Resting the shoulder and wearing a sling until the ligaments heal. Ice may help reduce pain and swelling. Eventually, physical therapy exercises will be used to increase range of motion and stregth. 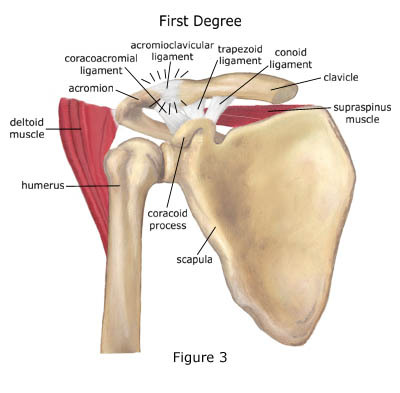 Most shoulder separations heal within 2 or 3 months without complications. If ligaments are severely torn, surgery may be needed to pin the clavicle in place.